These brownies are what dreams are made of. I made them yesterday for company last night and they were a hit. I invited a friend over today for one and it's a good thing she came when she did or else they may not have been around. 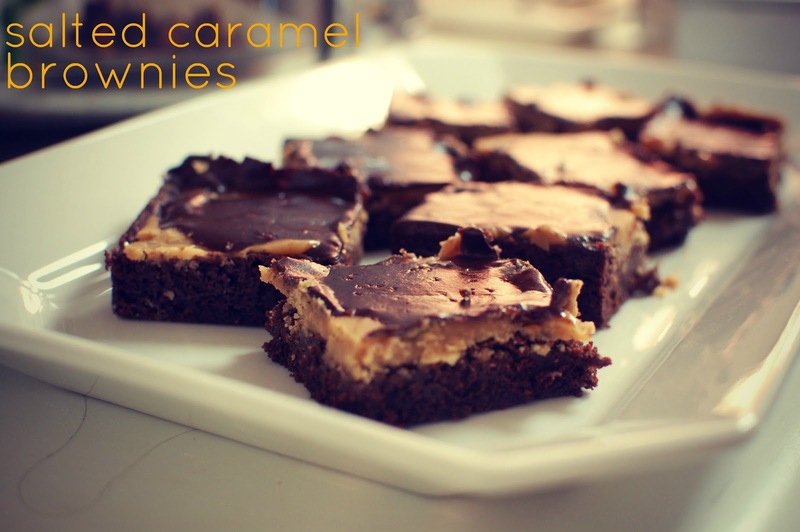 The fudgy brownie topped with the caramel and chocolate and salt make these melt in your mouth. Curious about salt on your desserts? It's amazing. If you have yet to try something that involves the word salted next to caramel you should go ahead and make it your mission to make these. You won't be sorry. 1/8-1/2 teaspoon coarse salt or fleur de sel if you have it. Preheat oven to 350 then combine flour through baking powder in a bowl. In another bowl combine the butter through vanilla then combine the wet and dry and place in a 9-inch square pan that's been sprayed with cooking spray. Bake for 19 minutes or until the center comes out clean with just a few crumbs. Let the brownies cool completely. Now in a heatproof bowl place the chocolate and remaining 2 tablespoons milk and heat for 30 seconds then stir. Stir so that it's melted and smooth and drizzle on top of the caramel layer. Sprinkle with coarse salt or fleur de sel. Stop it. These sound wonderful. I think I need to plan an occasion that combines these brownies and the sparkling lemonade you posted earlier! yes we are..in july! this is definitely a possibility though I'm already nervous about how anderson will be sleeping while we're there with the time change! I'll just have him rally to hang out with cruz and burke!